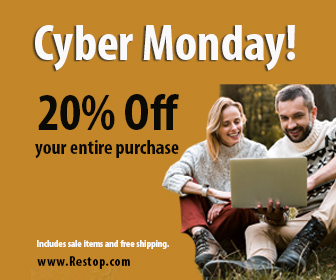 (1888PressRelease) November 23, 2018 - OCEANSIDE, Calif. – RESTOP is jump-starting the holiday shopping season with an unbeatable Cyber Monday deal: 20 percent off buyers’ entire orders and free shipping. The price drops on November 26th are sitewide (on most items) and even include sale items. •	RS2 Solid & Liquid Waste Bags: The patented “bag within a bag” design safely contains and neutralizes human waste and can be disposed of in regular trash receptacles. Like the RS1 bags, toilet paper and antimicrobial wipes are included. •	RS306 Commode with Supplies: This fully-stocked commode system includes a portable base with foam toilet seat, hinged lid, four liquid waste bags and six solid and liquid waste bags for instant access to a sanitary toilet. •	RS500 Privacy Shelter: Made of an opaque material, this sturdy, collapsible shelter affords complete privacy and folds into a convenient hands-free carrying case. It’s also available with an optional NEMO Helio shower. •	RS2000 Personal Lavatory System: This total system transforms into a private bathroom complete with privacy shelter, commode with seat, waste bags and shower.